CD Projekt isn't pulling any punches when it comes to Witcher 2 on the Xbox 360. When CD Projekt first announced that Witcher 2 was coming to the Xbox 360, fans across the planet exclaimed that the game couldn't be done proper justice on the system. Going by a presentation CD Projekt put together for E3 2011, this simply isn't true. CD Projekt played through a demo of the game running on the 360 which looked absolutely gorgeous. It runs on CD Projekt's RED Engine, which is cross-platform. The demo was of a prison break situation, with every of its four resolutions still intact. Content is not being cut just because it'll be transformed into a console game. If an area is explorable in the PC version, it'll be explorable in the Xbox 360 version. The PC game looked like it translated nicely to console. Button prompts appeared onscreen when Geralt needed to perform a stealth attack or another context-sensitive action. Combat is still robust, with strong and weak attacks, ripostes, blocks, magic, and other timing-based abilities. In what seems like quite a feat, the Xbox 360 version of Witcher 2 will have no loading screens. All of the game's DLC will be as free on console as it is on PC. Even further, the game's boobage will still be intact (believe me, I saw it), as CD Projekt is aiming for the most mature and complex game in the 360's history. 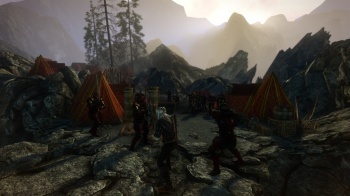 The demo allayed my worries that Witcher 2 would have to be a completely game because it was on a console. CD Projekt is trying to go as big in the console RPG space as it does in the PC RPG space. It's expected for release by the end of 2011, and there's the possibility of Witcher 2 also coming to PS3 if CD Projekt can make it happen. See all our coverage directly from the show floor.